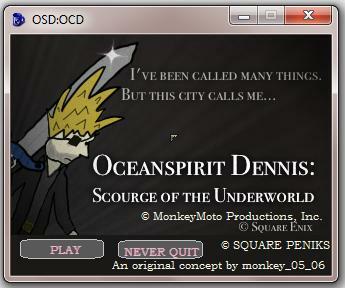 Oceanspirit Dennis: My Very First AGS RPG Game Ever Made by Me and Square Enix: Can Someone Please Tell Me How to Upload It So You Can All Play It: Episode VIIIXCMIICM: The Legend of Zelda Edition 3DSX: Ocarina of Majora's Past: Cloud Strife's Precursor Story! !1: PubMasterQuestPMQLEgeNDS: DON't post in MY THREAD if you don't like This Game Plxkthnz: Oh, ALSO KINGDOM FINAL HEARTS FATNASY VIXYCCII: ãƒ¤ã‚¤ã‚¨å¾·è–©ãƒ«ä¸‰æŒ¯ãƒ‡ã‚µè¥²æ“Š In this game you will explore the awesomitity that is Oceanspirit Dennis and get to see all sorts of stuff about how he came to be the Scourge of the Underworld. Based in the world of the incredible Oceanspirit Denniverse, this game is the largest look we have ever had into how Oceanspirit Dennis became the incredibly lovely man that he is today. Chock full of bonus extra features, this game is sure to amaze! Monkey's OSD epic! Packed with truly stupefying voice acting (including my VA debut), this game is somehow ambitious and lazy at the same time. A true OSD milestone. (Plus it has loads of unlockable secret characters to play).